Maybe he was just a nice guy. Maybe the secret to old men’s souls is in a nod and quiet “San Ban Oh” when you catch eyes at a bus stop when you’ve both lingered there longer than most. Whatever the case, the man stuck out to me even before we got on the bus. He wore a tie. Not a whole suit; though it was hard to tell under the hat and overcoat. He was old – but not ancient. He was old, I was tired, and the weather was hormonal. It wasn’t a bad day, just a crazy-weather one. Snowstorms and wind with breaks of sunshine and beauty. When trolley 3 finally pulled up I was more than happy to get on. So was everyone else, apparently. The bus wasn’t crowded, really, but there was a good number of people still standing. I boarded via the back doors and walked by an empty seat, knowing it would be filled immediately by someone older than I, before positioning myself standing in the aisle as usual. there was a tug on my arm. I shoulder-checked to find the Old Man With a Tie pointing down to the seat, like he saved it for me. 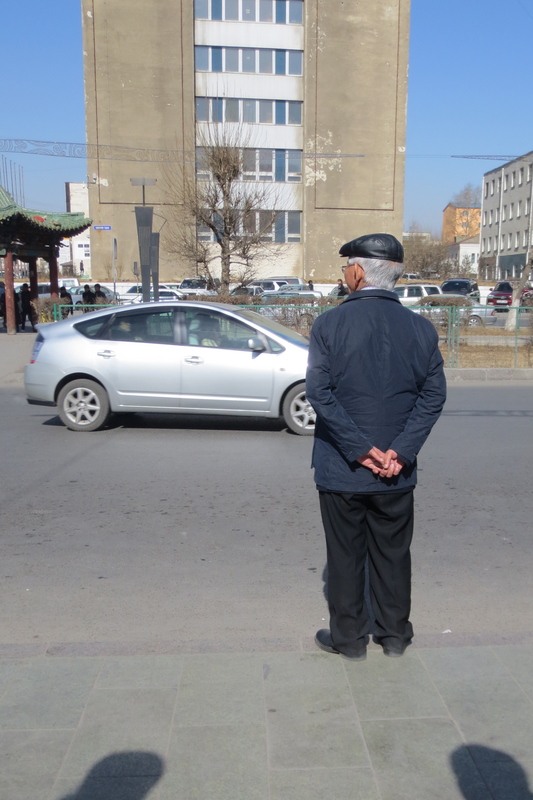 Now in Mongolia it is absolute custom that the elderly get the seats in the bus. It is common practice for an older person (age 40+) to tap the shoulder of someone already seated and be given the seat. The shoulder tap shouldn’t be necessary, really. People know that seats are to be given to the elderly or those with small children. I think it should be like that everywhere in the world. Another day, man, and bus stop. I like people watching. However, today, the man was reserving the seat for me. He walked on, found a seat near the front, and tapped the shoulder of the young man who sat in it. Strangers who are nice to me never cease to blow my mind.